That is one disapproving owl. If he had glasses, he'd be peering at us over them. 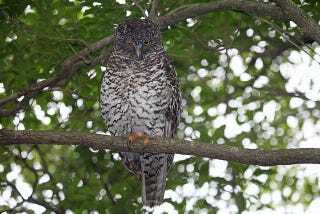 This is a photo of a Ninox strenua, or "Powerful owl." And yet, with one head movement, this same species becomes an instant clown. Just a raised head and opened eyes, and the "powerful owl" becomes a "surprised owl."